The seat that grows with them. What a Grand idea! Created to comply with the new future I-SIZE (ECE R129) standard. For children from 9 (20lbs) - 36kg (79lbs). Height-adjustable headrest and harness with easy one-handed adjustment. Grand from Jané is here; the new evolutionary safety seat designed to protect babies from 9 to 36 kilos, approximately 9 months to 12 years. Grand is a multi-group seat 1-2-3 designed to adapt and grow with the child at each stage. It is quick and easy to safely install using the Isofix anchors, and can be fitted on the front or the back seat of the vehicle. The child will always be protected as it is also fitted with the Top Tether (anti-rotation strap). 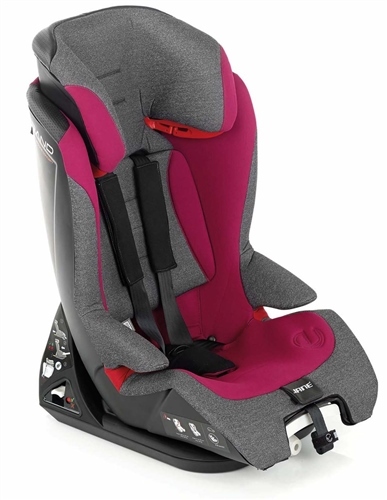 Grand has been approved as a child restraint system for the car, under standard ECE 44/04 and has been designed in accordance with the future i-Size regulations for children from 71 to 135 cm. ( Approx. 9 months to 12 years). Group 1, 9 – 18 kg, approx 9 months to 4 years: Install the car seat with the Isofix anchors and anti-rotation strap (Top Tether). The child is held secure with the integrated 5-point seat harness. Group 2 & 3, 15 and 36 kg. approx 4 to 12 years: Install the car seat directly with the vehicle 3-point seat belt and optionally the car seat can be secured with the Isofix anchors. The child is held secure with the vehicle 3-point seat belt. Longevity - this new evolutionary car safety seat is designed to protect babies from 9 to 36 kilos, approximately 9 months to 12 years. Reclining button, 3 position reclining seat. ISOFIX with Top Tether (Universal Classification). Group 1: Adjustable headrest and harness height, to protect the child better in the event of a side impact as it supports the head better. Switching from Group 1 to Group 2-3: Changing the "anti-misuse" straps. Switching to a booster seat with backrest without having to detach the integrated straps, simply conceal them, this prevents any installation errors that could affect safety. Group 1: for children weighing between 9 and 18 kg. Installed in the vehicle using the ISOFIX anchors and top teether. The child is held secure with the integrated 5-point harness. Group 2-3: for children weighing between 15 and 36 kg. Installed directly with the vehicle seat belt and optionally the car seat can be secured with the ISOFIX anchors. The child is held secure with the vehicles 3 point seat belt. Jané Grand car seat installation video.